Clifton, NJ, May 5, 2016 — There are so many types of gluten-free flour in the marketplace that a newbie may feel a bit overwhelmed when it comes time to get cooking or baking. Some flours just work better for certain types of recipes than others and for many recipes a blend of flours is needed as a single flour may not have the same properties as a standard gluten variety. Once you start experimenting and learning which combos and flavors you love best, you’ll become a pro at whipping up the perfect gluten-free breads, pancakes, muffins and more. PEREG Natural Foods (www.pereg-gourmet.com) has extended its popular line of gluten-free flours, offering consumers even more cooking and baking options. 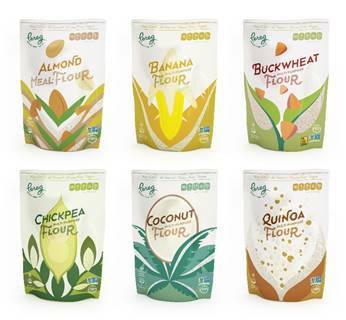 The new line of flours consists of five varieties including: almond, banana, buckwheat, chickpea, and coconut. All are gluten-free, all are 100% natural, non-dairy and certified kosher. Pereg is proud of these healthful alternatives to white flour. They are packaged in 16 oz. re-sealable stay-fresh bags, retailing for about $3.99. According to Pereg President Gil Schneider, “It takes a little more work to get a recipe just right when it comes to baking gluten-free, but the payoff is always satisfying. Once you have a good base recipe, experiment a bit and make it your own.” Since each gluten-free flour type offers its own unique flavor and baking properties, Pereg offers a guide to using these flours for the best and most flavorful culinary creations. Pereg Buckwheat Gluten-Free Flour – Buckwheat is the seed of a plant and is related to rhubarb, not wheat, rye or barley. Despite the confusing name, buckwheat is gluten-free and high in fiber. Because it’s packed with essential minerals it can really boost the nutritional value of gluten-free recipes. Gluten-free buckwheat is among the top five easiest flours to work with. It can be considered a “base flour” and can be used as a large proportion in your flour blends. Use it to make crepes, pancakes, English muffins, cookies and buns, and to thicken soups, stews and sauces. Pereg Quinoa Gluten-Free Flour – It’s good to know just how versatile quinoa flour is. It creates soft baked goods but is also a fantastic all-purpose type of flour. Quinoa flour is especially great for baking gluten-free breads because of its protein content. Since gluten is a protein, it is important to use higher protein flours (such as quinoa) when baking gluten-free. The protein in quinoa flour helps to give your bread structure, and will improve the overall texture. For best flavor, try toasting your quinoa flour before using it: Spread it out onto baking sheets covered in foil or parchment paper, and bake at 215 degrees for 2 ½ – 3 hours. You’ll know the flour is ready when its scent is nearly gone and the flour has a mild flavor. Once it’s been toasted, your quinoa flour should keep well in the fridge or freezer for about 8 months. Even after toasting, quinoa flour does have a very slight sour flavor – which lends itself beautifully to bread and English muffins. Pereg Gluten-Free Banana Flour – Because of the high starch content in banana flour you can use less flour than specified in your everyday recipes. Rule of thumb is to use 30% LESS Banana Flour than wheat flour. Banana flour mimics the results of wheat flour remarkably well, making for an easy transition to banana flour in your everyday baking. Banana flour works well by itself, but also complements most other flours wonderfully. Made from peeled, ripe bananas, the flour has minimal taste. When consumed raw, it has a hint of banana flavor, but once baked into your final creation the taste has an earthy, wholesome flavor. The texture is light and fluffy – you’ll have a tough time believing it comes from bananas. Banana flour can add a boost in nutrients to your morning smoothie, add thickness to your soups or sauces, and can be used as a great additive to natural homemade baby foods. As you might imagine, it also makes great banana bread. Pereg Gluten-Free Coconut Flour – Baking with coconut flour is like nothing you’ve ever experienced before. It’s super absorbent, but doesn’t have a lot of binding power. You’ll notice that recipes using coconut flour use a lot of eggs and very little flour. That’s because, as it lacks structure, without the addition of other ingredients to add body, it wouldn’t hold its shape well. The eggs provide moisture, act as a binder, and also give the baked goods structure. Like almond flour, if you’re new to baking with coconut flour, stick with recipes that have already been tested and proven to work. You can’t substitute coconut flour 1:1 with any other flour; it simply won’t work. If you’re building a coconut flour recipe from scratch, a good rule of thumb is that for every 1/4 cup coconut flour in a recipe, you need to add two eggs. If you’re mixing in other dry ingredients, such as cocoa powder, your egg ratio will need to go up even higher. Can you taste the coconut flavor in recipes? In neutral tasting items such as pancakes, you can taste it a little. But if you have other strong flavors in your recipe, you usually won’t be able to taste it at all. Pereg Gluten-Free Almond Flour – When you’re baking with almond flour, remember that it does not behave like a “normal” flour. It’s much higher in fat and therefore needs some adjustments. When you bake with almond flour, you’ll notice the texture tends to be more on the tender and cake-like side, that’s because of the higher fat content. Almond flour recipes tend to use more eggs and less fat. The eggs provide more structure and moisture, but don’t worry, your baked good won’t taste egg-y! Almond flour’s natural fat content reduces the need to add fats such as butter or cooking oil. Use almond flour in small amounts. Don’t let the texture of the batter throw you off: Almond flour batters are almost always thicker than traditional wheat-based or other gluten-free recipes. Refrain from adding more liquid, because if you do, your baked goods won’t bake through. Great uses are in pizza crust, shortbread cookies and chicken nugget coating. In addition to gluten-free flours, Pereg Natural Foods produces an extensive line of quinoa products, spices and ancient grains, as well as flavored basmati rice, couscous, farro, salad toppings and salad spreads. All Pereg products are kosher certified by both the Orthodox Union (OU) and CRC, are dairy and lactose-free as well as all natural, with no additives or preservatives. Many products are also certified gluten-free and non-GMO. Pereg products are available at select retailers throughout the US and Canada, and through their website, www.pereg-gourmet.com.